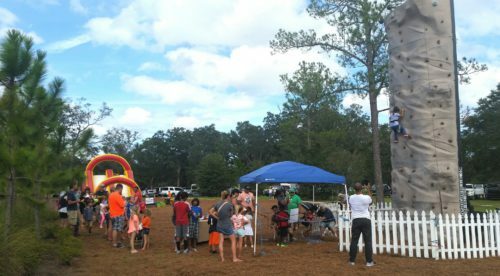 More than 2,000 visitors recently attended the Fall Festival and Community Open House at TrailMark, the area’s nature-first community located just 20 minutes from Jacksonville in northern St. Johns County. With a pumpkin patch, farmer’s market with fresh fruits and veggies, the area’s most popular food trucks and more, residents and guests celebrated the season and fall traditions. The kiddos adored face painting, the giant slide and the rock climbing wall, while everyone grooved to live music from the popular band, Love Monkey. Many also visited TrailMark’s amenities and toured the community’s beautifully decorated model homes. With impressive oak tree hammocks, lakes, winding waterways and trails, TrailMark has been carefully planned around its natural environment and offers a recreation-rich lifestyle with thoughtfully designed amenities, such as trails that connect residents with their neighborhood and a planned kayak launch to Six Mile Creek. The amenity center and Camp House, a lakeside pavilion, are not only popular destinations for TrailMark residents, but also gateways to lasting friendships. TrailMark is located within the highly rated St. Johns County School District and zoned for Nease High School, Pacetti Bay Middle School and Picolata Crossing Elementary School, which is adjacent to TrailMark. TrailMark’s builder team, which includes David Weekley Homes, D.R. Horton, Landon Homes, Providence Homes and MasterCraft Builder Group, offers a variety of single-family home designs to meet the needs of today’s homebuyers. Homes range in size from approximately 1,500 square feet to more than 4,000 square feet. Four designer-decorated model homes are open daily, several move-in ready showcase homes are available and many more under construction. Homes are priced from the $200,000s to the $500,000s. TrailMark is located at 805 TrailMark Drive in St. Augustine. The community’s proximity to Interstate 95, Jacksonville and St. Augustine offers residents easy access to entertainment, shopping, dining, employment centers and more. To visit TrailMark from Interstate 95, take exit #323/International Golf Parkway southwest towards World Golf Village and travel approximately 2.2 miles. Continue past the intersection at State Road 16 (where International Golf Parkway becomes Pacetti Road) and proceed approximately 2.6 miles to TrailMark on the right. For more information, visit www.TrailMarkLiving.com. TrailMark is such a great community to live in! So happy we bought our home here!